After a morning of drizzle, it was fair at lunchtime, but the weather closed in atmospherically as we walked, all the shades of grey you could ever wish for. Tweeddale Court, with its publishing connections past and present (Oliver & Boyd, Canongate, The List), and the former home of the Scottish Poetry Library, was very still, bolted doors and no sign of life. As I read my poem ‘Courtyard Reading’, about the open festival events the SPL used to run there, I felt like I was raising a few ghosts. From Jeffrey St the Old Royal High School, mentioned in Robert Garioch’s ‘Embro to the Ploy’, was invisible through the fog. 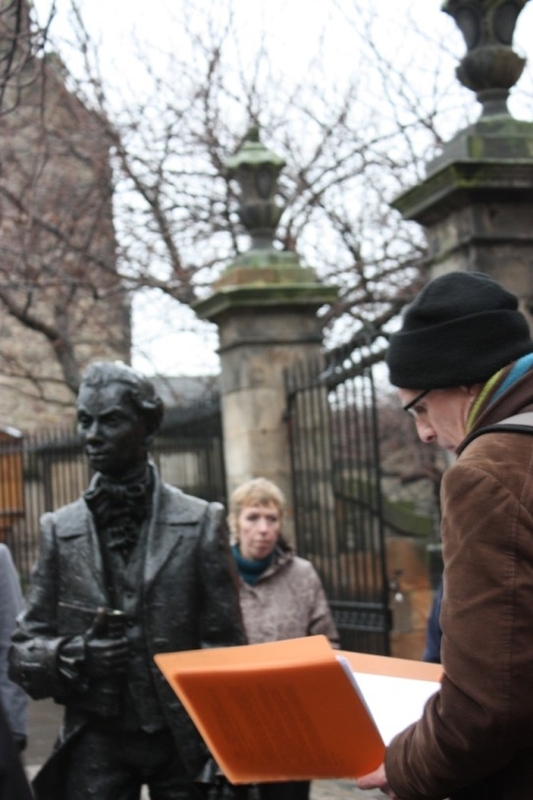 After a children’s rhyme in the spacious Chessel’s Court, and a tragic ballad in the vennel at John Street, we paid homage to Robert Fergusson at the Canongate Kirk. His sculpted image strides energetically downhill, while his gravestone bears a verse written by his great admirer Robert Burns. Sadly Dunbar’s Close was locked, but we were able to glimpse the ornamental hedges through the gate. 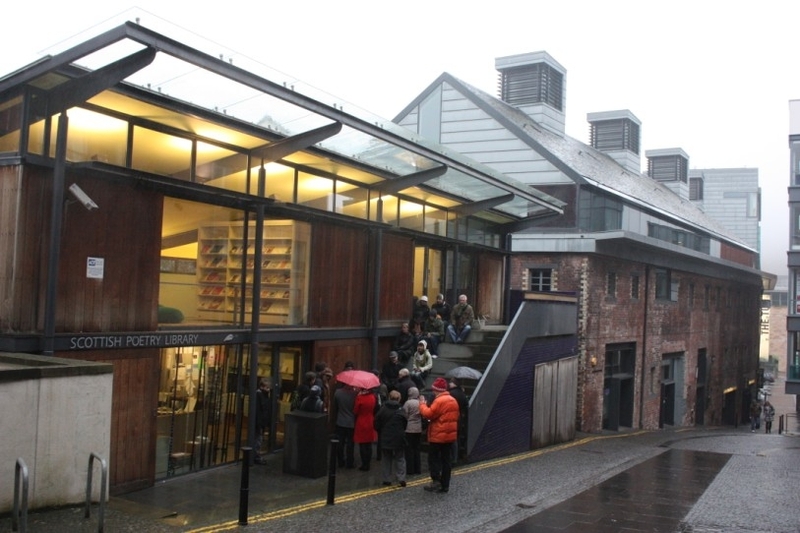 We concluded in Crichton’s Close at the new home of the Scottish Poetry Library, with another sonnet, by Iain Crichton Smith, part of which is inscribed in the fabric of the building: ‘this house, this poem… this fresh hypothesis’. 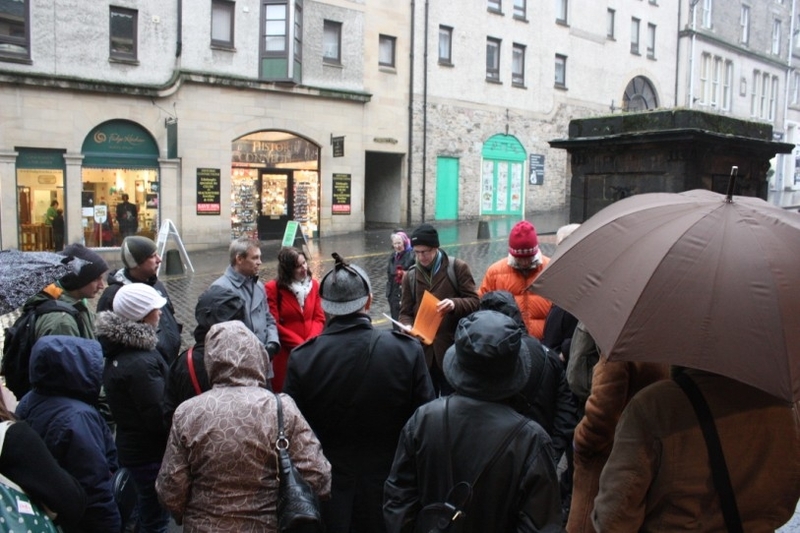 I’ll be running another poetry tour on 27th February – email events@cityofliterature.com to book. These events are part of the Carry a Poem programme.